To be clear, Neil Gaiman is one of my favorite authors. I count his graphic novel, The Sandman, among the greatest achievements in the medium, and I adore his forays into film, Coraline and Stardust. Gaiman is my kind of writer. Each of his works takes a daring, no-holds barred approach to fantasy, often delving into the surreal. In my view, he is the spiritual successor to H.P. Lovecraft, if not in style, certainly in the power of his imagination. I like him so much, in fact, he is the only author I have reviewed twice, the first for The Sandman, and now for American Gods. He decided he needed sleep, or just not to drive any longer, and he pulled up in front of a Night’s Inn, paid thirty-five dollars, cash in advance, for his ground-floor room, and went into the bathroom. A sad cockroach lay on its back in the middle of the tiled floor. Shadow took a towel and cleaned off the inside of the tub with it, then ran a bath. In the main room he took off his clothes and put them on the bed. Unless Gaiman is trying to make some sort of statement regarding motels, or unless the cockroach plays a significant role later in the story, we just don’t care. And, unfortunately, there are many such passages within the book’s five-hundred pages. To be fair, I did read the 10th Anniversary Edition, with the author’s original text, which only goes to prove that sometimes a good editor is a writer’s best friend. This isn’t to say that American Gods is boring. Despite a glut of needless exposition, the novel’s originality and likable protagonist keeps you intrigued until the end. The selling point is the high-concept premise. 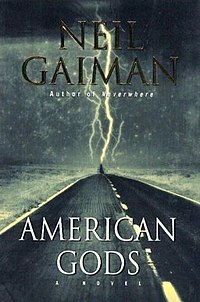 As the title suggests, American Gods takes place in modern day, but in Gaiman’s universe, the Norse and Hindu gods, as well as every other mythological being you can imagine, exist and have always existed, and are currently residing in the good ol’ U.S. of A. The old gods are nothing like the all-powerful entities you may have read about, however; their power, their very survival, depends on humans believing in them—which explains why we don’t see or hear much about them anymore. A god without worship turns into a lesser being, like a sprite or leprechaun or a kobold, while a completely forgotten god ceases to exist entirely. This isn’t a completely original ideal. In fact, the 60’s Star Trek episode, Who Mourns for Adonias? explored the same theme, but Gaiman is clever enough to avoid the typical pantheons we all know and love, focusing on a broader spectrum of belief, from little known Hindu, American Indian, and African spirits to the nearly forgotten (likely invented) Lovecraftian gods of prehistoric man, all of which makes for some fascinating reading, and an interesting take on how faith/religion works. The central plot itself is quite pedestrian by comparison. It involves a guy named Shadow, recently out of jail, whose wife dies in a car accident. Shadow is a simple, unassuming character, with a hard code of honor that makes him easy to sympathize with. He soon meets an enigmatic stranger named Wednesday, who turns out to be Odin, which comes as no surprise to anyone familiar with the Norse pantheon. Through most of the novel, Shadow follows Odin around the country visiting small towns, which often reads like a love letter to all things America. It’s fun to come across some alien landscape (going backstage, Odin calls it) or an African spider god in the form of an old black man, but the story never congeals properly, and we never get a sense of Shadow’s motivation other than great loyalty to his employer. Eventually, we learn about the new gods in opposition to the old, modern deities representing TV, the Internet, even the railroad. A whole lot of fuss is made over an impending war between old gods and new, for which you might expect something epic, some titanic struggle to make Avengers look like a schoolyard fistfight, but the payoff is anticlimactic, boiling down to little more than a murder mystery. The other problem I had was the glaring omission of the Christian God. Although Jesus is briefly mentioned, you can’t honestly tell a story about the fall of old religions without mentioning YHWH. Gaiman’s book insists the old gods were forgotten when immigrants came to America, but that isn’t historically accurate. If anything killed Odin, Zeus, or Ra—it was the change of faith to the more popular god of the Hebrews. Maybe Gaiman was worried about offending believers; after all, this is a deeply religious country, but in a book about gods, it’s hard to ignore the BIG one. I hate to leave my review on a sour note, because Gaiman does so many things right. There is much brilliance to be found in American Gods, such potential it’s a real shame it fails to deliver. But Gaiman’s failure greatly exceeds other books’ successes. I was especially fond of the historical asides interspersed throughout the novel, short stories dealing with the first settlers to America, from Irish immigrants to the slaves brought to Haiti to the prehistoric people who first crossed the Siberian-Alaskan land-bridge 15,000 years ago. Gaiman’s talent really shines in those parts, which just goes to show that not every writer works best in every medium. Like Lovecraft, whose shortest stories are also his most brilliant, Gaiman loses focus in a longer format, at least that seems to be the case with American Gods. Overall, I recommend the book, though the ride is often more enjoyable than the destination.